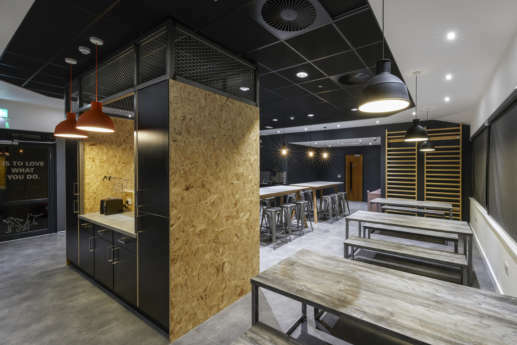 We worked with the Hut Group to design and build a new home for their MyProtein health and fitness brand. 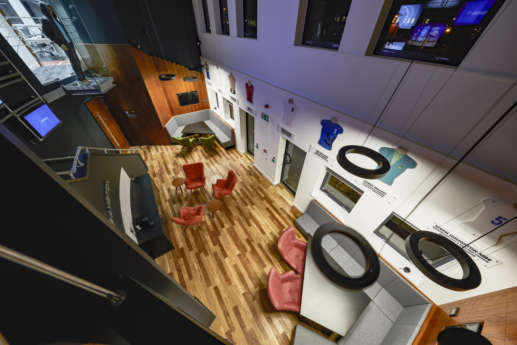 Set on their Gadbrook Park Campus in Northwich, we delivered a young and dynamic space that reflects the active nature of their brand. 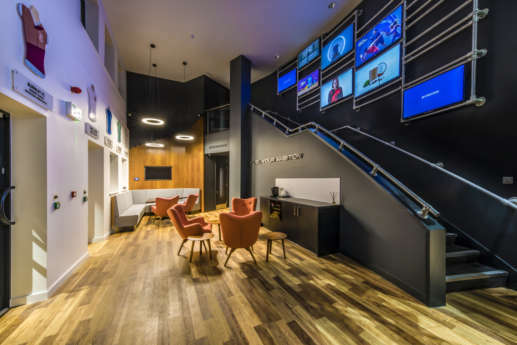 MyProtein were after a fun new headquarters for their growing team. 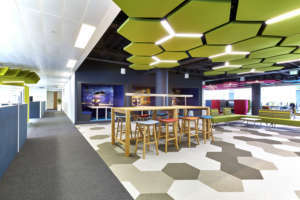 They wanted the space to be inspirational and bring about greater interaction between teams. 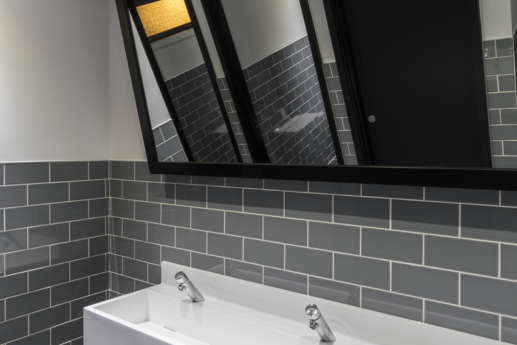 We worked closely with their internal team to develop a style that had strong links back to sports and fitness, while still providing a productive work environment. 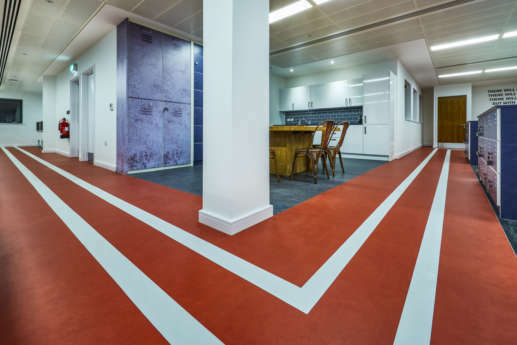 The project consisted of a full refurbishment, stripping the space back to a shell and core before installing new ceilings, flooring and mechanical and electrical equipment. 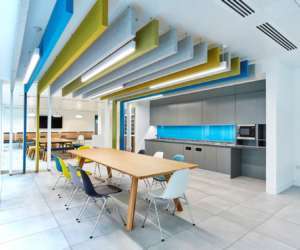 The project started off with a complete strip out the existing space back to a shell. 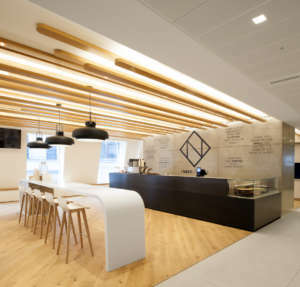 We removed some of the first floor space to create the stunning double-height reception area. 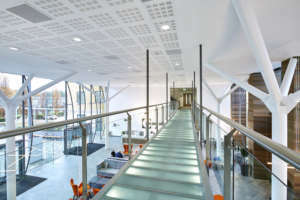 All mechanical and electrical systems were removed, with a new scheme designed and installed to include heating, ventilation, lighting and air conditioning. 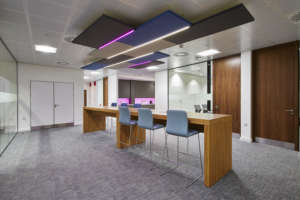 This allowed us to maximise the floor plate and design a layout with partitioning that complements the business setup and their way of working. 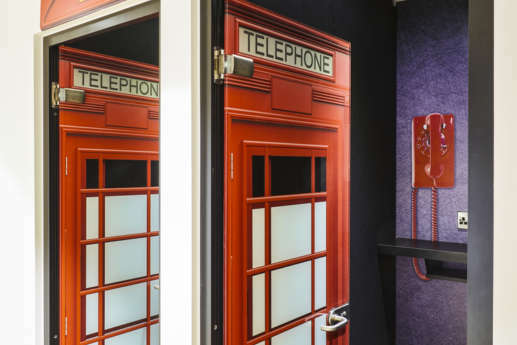 From stepping into the reception, you can tell that you’re not about to enter your usual corporate office, as the reception space more closely resembles a high-tier fitness club, rather than your typical corporate park. 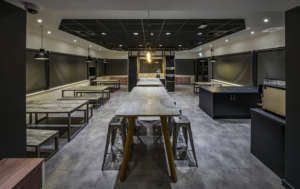 With double-height ceilings, timber floorboards and contrasting black walls, guests are treated to a high-octane welcome at the MyProtein campus. The first glimpses of the sports inspired industrial theme are seen through the industrial piping handrail above the stairwell and stylised sports jerseys that represent each of MyProtein’s ambassadors from various sporting disciplines. 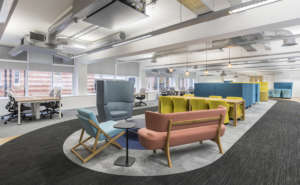 We’ve continued this theme throughout the remainder of the office; from chipboard walls, to industrial lockers, vintage furniture and even a running track that spans the length of the office. We took the chance to have a bit of fun with the most universal symbol of any sports supplement brand; the protein shaker! 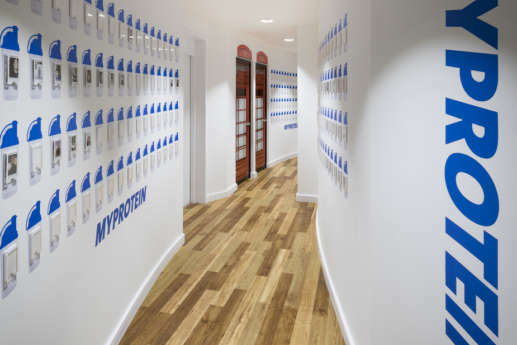 We’ve featured miniature protein shakers along a curved hallway that are used to display headshots of the team members in the office at any particular time. This fun twist on a staff board helps to increase recognition and collaboration throughout cross divisional areas. So, you’ve had your pre-workout and you’re ready to hit the desks. 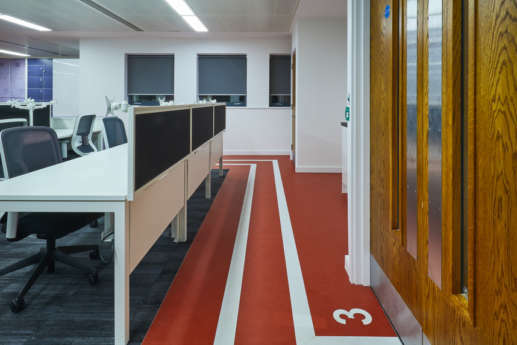 As you continue into the open plan workspace, you’re greeted with the three-lane running track to guide you around the perimeter of the office. Just make sure to take the outside lane when doing a tea run! 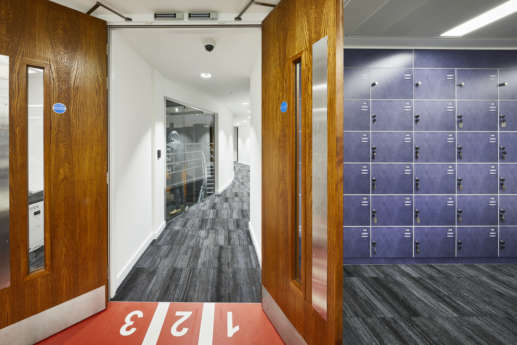 The industrial theme is continued across the fit out with iconic gym-style lockers for team members to store belongings away from their desks, keeping the space clean. 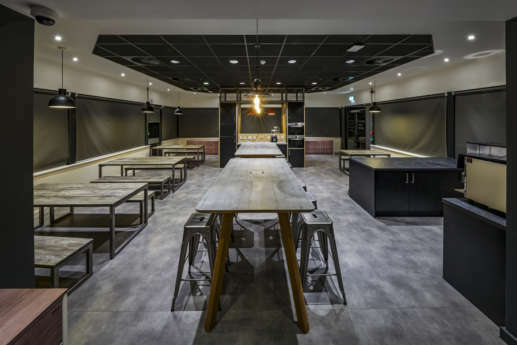 To keep pace with MyProtein’s ambitious growth plans, we made sure the workstations can easily be arranged to scale up their operation and accommodate future staff. 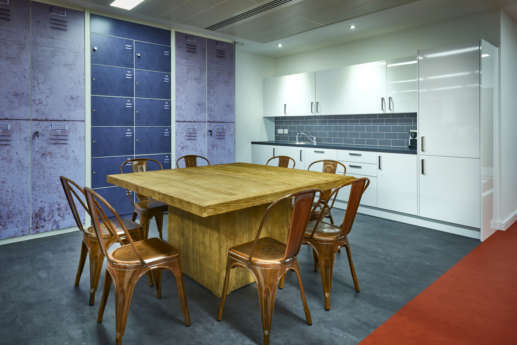 The staff kitchen and cafeteria continues the sports-inspired theme of the office, instead this time being styled as a large locker room. Staff can take their break and have lunch (or a protein shake) at the industrial-style timber benches. 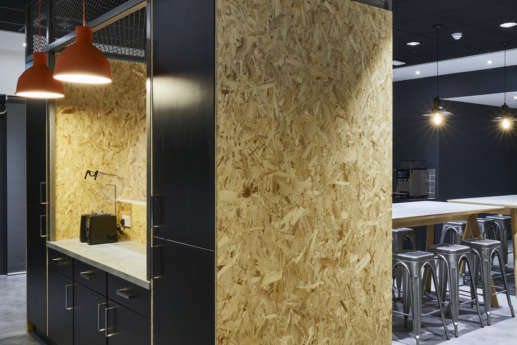 The theme is continued with exposed services, contrasting ceiling designs and a chipboard partitioning that frames the kitchen utilities and splash back. 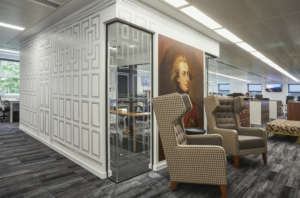 This provides a great communal space for teams to come together and collaborate throughout the workday.